Kingsoft Internet Security 9 is a anti-virus, anti-spyware and firewall all-in-one security protection and detection system tools for Windows Vista and Windows XP PC. 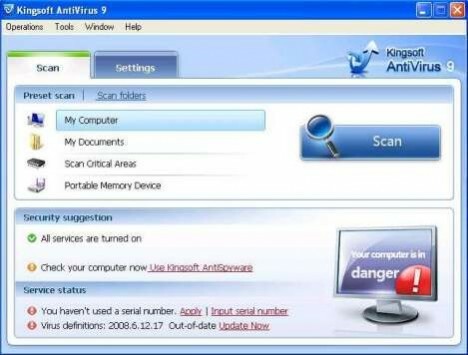 Like Rising AntiVirus, Kingsoft Internet Security 9 is another product from Chinese company, which also develops Kingsoft Office. Kingsoft Internet Security 9 suite has already been accredited by VB100 and Checkmark, which proven the application’s ability to provide protection and removal of malicious threats. It’s popularly known as DuBa in China, with latest version called Kingsoft (DuBa) Internet Security 2008. DuBa has been available in China and Japan for a while, but only recently the English version is made available to the world at large, and is named as KIS 9 (not Kaspersky Internet Security though). Kingsoft Internet Security 9 features multiple scanning engines for viruses, malware, spyware, Trojans, worms and rootkits, viral signature delivery, boot clean, and realtime file safety checks against whitelists in Trusted Authenticity Servers assist in providing a comprehensive level of virus and spyware detection ensuring system including private information is protected against even the latest Internet threats. Kingsoft Internet Security 9 is available for free download with generous 180 days or 6 months free unrestricted usage period with unlimited update and support services, without the need for any registration, e-mail submission, product key, serial number or anything else. Just download and install KIS_International_9_Online_ENG_RTM_20080613.EXE. Kingsoft Internet Security 9 supports Windows Vista, XP, 2000, 98, Me, and it’s small in size and will not slow down PC, for those who think that most modern anti-virus software is bloated and consumed too much system resources.